Qualcomm wins 5G, and no that is not overstating it, by means of new QTM052 mmWave antenna modules. SemiAccurate thinks this device, along with the QPM56xx sub-6 GHz antenna and the X50 modem will be an unbeatable combo for 5G phones. Why do we bluntly say Qualcomm wins 5G? To start with the competition is breathlessly talking about how it will make your life better, sponsoring $200m sporting events, and not showing silicon. Why? Because they can’t, the devices people get a glimpse of are FPGA boxes, the ‘chips’ shown off are badly photoshopped fakes. Then there is what Qualcomm is showing off. 18mm is the long dimension…. What you see above is the QTM052 integrated antenna module for 5G phones, it works on the 28GHz mmWave band. It isn’t an antenna, it is an array of mmWave antennas with full diversity, beam forming capabilities, envelope tracking, a full RFFE, and power ICs (PMIC). In short it is a full signaling solution in an ~18mm long device that fits in a phone bezel. The competition has a slightly more… err… robust antenna solution. More important is that these modules, along with the QPM56xx sub-6 GHz antenna modules, pair with the upcoming Snapdragonn X50 5G modem, and likely the upcoming X24 integrated modem too. The X50 is effectively a coprocessor for the current Snapdragon 835 and 845 modems so any design that uses them could slap on an X50 and a few antenna modules and be a 5G phone. Better yet the X50 supports four of these modules, a key for mmWave. Four antennas are deadly important for 5G in the mmWave bands because those signals are attenuated to the point of being effectively blocked by things such as hands, heads, and other matter. On the up side the signals reflect well so their directionality is mitigated a bit by a room with windows, flat walls, and the like. That said four modules will get you front, rear, left and right, so along with reflections and careful placement you shouldn’t get an iPhone antennagate type whoopsie. Then again mmWave is new and there is a lot of real world learning to be done so if it works acceptably now, it should be great in a few generations. We hope. Back to the winning part, the reasons should be somewhat obvious now. 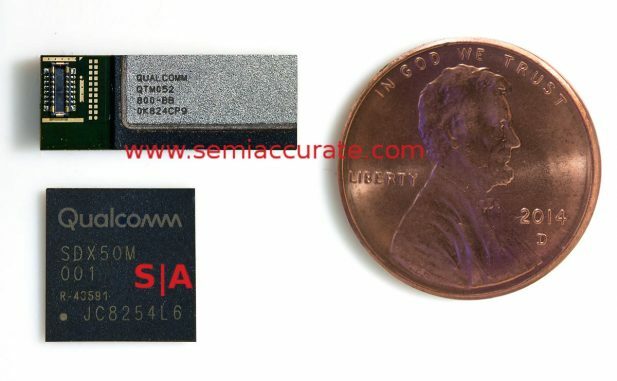 Qualcomm has silicon, pictured above. It has been in functional phone form factor devices for almost a year, SemiAccurate first held a 5G reference device last October. The competition is desperately hiding the fact that they are using FPGAs and photoshopped ‘real silicon’. Qualcomm has 18mm long antenna modules that you can slap four of into a phone with ease, and the modem to support it is actual production silicon. The competition has something that would not be out of place in a Sally Fields movie. More importantly the competition doesn’t have an integrated antenna module, or at least haven’t talked about it yet. Given the woeful state of their LTE and 5G program, we will err on the side of reality and say they don’t have anything close much less something that will fit in a phone form factor. Qualcomm says they will have 5G phones on the market in early 2019. Since the silicon is in production now, we think CES is a good guess for the first reveal with MWC having a flood of 5G phones. Intel promises 5G PCs in “late 2019”. Did we mention that those Intel 5G modems are said to be built on Intel’s 10nm process, you know the one that doesn’t work? Again we will err on the side of reality and say that at least one of these promises will come to pass. No make that only one.